Southern Manitoba will be under the influence of a complex low pressure system this weekend that will spread multiple bands of precipitation across the province. Things are a little uncertain for Sunday – Father’s Day and the Manitoba Marathon – but it’s looking probable that it may be quite wet. Increasing cloud; chance of afternoon showers. 5-10mm of rain overnight. Cloudy; some light rain or drizzle possible. Rain likely; up to 20mm. Today will be a relatively nice day. Cloud coverage will gradually increase and there will be a slight chance of showers in the Red River Valley this afternoon as rain spreads eastwards across southern Manitoba. The temperature will climb to around 21°C. Showers will move into the Red River Valley through the evening with around 5-10mm falling. While there may be an odd rumble of thunder, overall the thunderstorm threat is low to non-existent. Rain will move from southwest to northeast and lift into the Interlake region, leaving us with overcast skies by morning. The low temperature will sit near 12°C. Total expected rainfall for the first wave of rain today through tonight into Saturday morning. Saturday will be a mainly cloudy day with some showers or drizzle likely. It doesn’t look too wet, but overall it will be sort of a dreary day with sporadic precipitation. Further north, through the Parkland region eastward into the Interlake, there will likely be rain for much of the day. The high temperature will be near 18°C and expect the temperature to drop to around 14°C on Saturday night. Sunday, which marks Father’s Day and the ever-popular Manitoba Marathon, has a little more uncertainty associated with it. The general weather picture shows a stalled out low pressure system over SE Saskatchewan and SW Manitoba while a Colorado low lifts northwards through the Dakotas. The evolution of the feature is very complicated, and small changes in the upper-level flow could mean big changes to the expected weather over Southern Manitoba. I’ll give the most likely solution right now, and leave updates in the comments below if it looks like an alternate solution becomes more plausible. 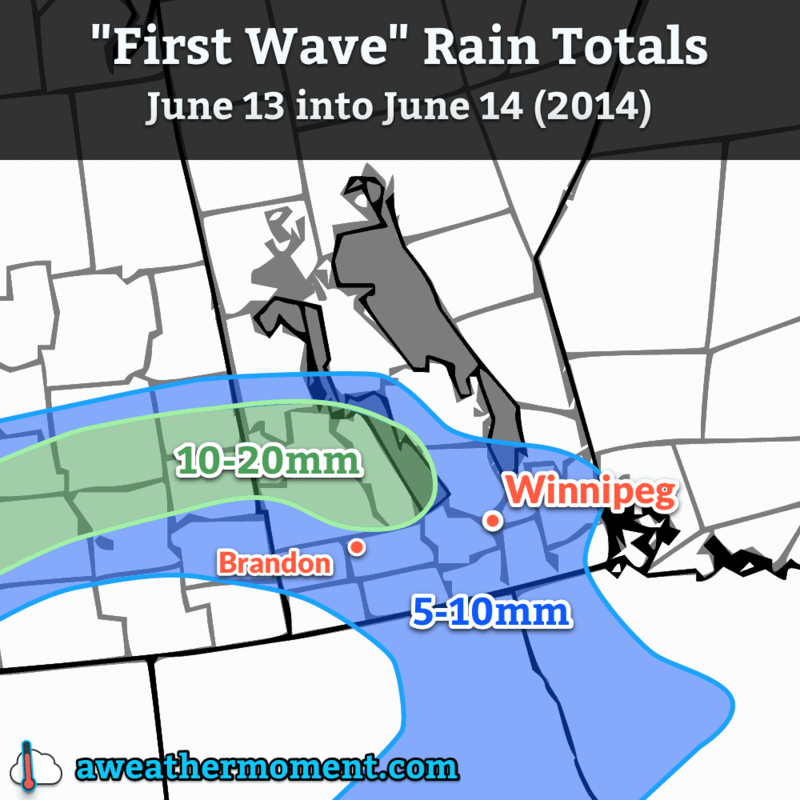 The GDPS is forecasting a very wet Sunday with 10-20mm of rain through many areas of Southern Manitoba. Sunday morning will provide a cloudy start to the marathon with some scattered showers or drizzle about. The temperature should be around 15°C. By mid-day, more concentrated shower activity will push northwards through the Red River Valley, with an area of rain covering much of southern Manitoba (save for locations near the Saskatchewan border) by early-to-mid afternoon. The rain will persist into the evening and taper off by Monday morning. Total rainfall amounts are quite variable, but overall it seems like 10-25mm is possible in most regions, with higher amounts near the US border through SE Manitoba and along the western escarpment of the Red River Vally northwards into the Riding Mountains. Anywhere from 25-40mm seems possible in these areas. The temperature will drop to around 10°C on Sunday night after the rain tapers off. Next week is looking fairly unsettled as yet another major disturbance takes up residence on the Prairies. In general, more cloud than sun will be seen through the week. Heavy rainfall will set up in Alberta on Monday, and as the system develops it looks like a large area of convection will develop across the Northern Plains and lift northwards into the southern Prairies, including Winnipeg and the Red River Valley, by mid-week. It’s a long ways off, though, so we’ll take a closer look later in the weekend when things become a little more clear.